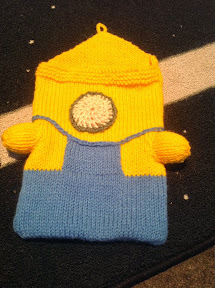 As the other Minion themed patterns have been going gang-busters, it was time to finish this iPad cozy. I admit it’s been on the needles for like a month! It’s been a crazy month, and my wrists were still recovering from RSI from knitting the Doctor Who Scarf. But I am pleased with this endevour no end. Cut yarn, thread through remaining stitch. Crochet a chain approx 5 cm long, attach as a loop to the top of the point. 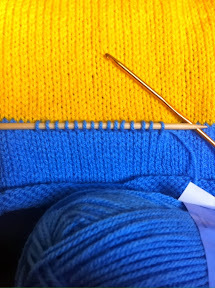 On the short side of the cover, pick up 15 stitches in blue for the front of the overalls. These should start 10 stitches in from the edge. Stst 10 rows in blue. Stitch up the side and bottom of the cover. Insert iPad or cardboard the right size into the cover. Embroider overall straps and eye-goggle band on. This helps to keep the right shape for the cover. Crochet a white circle, approx 8cm in diameter. Crochet one row of grey around the white centre and stitch onto the cover. Stitch a large black button onto the centre of the eye. You could use felt rather than crochet the eye piece. 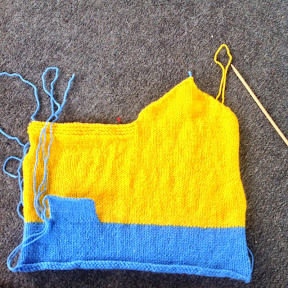 Cut yarn, slip all remaining stitches onto yarn, pull to tighten. 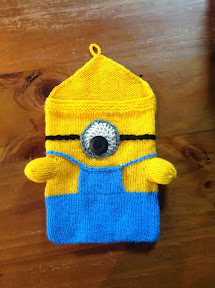 Stitch up the side, stuff and attach to the cozy.